With the intensifying of the Second World War, Council Executive Palmer Liddle entered the United States Navy in 1942. The Northern Litchfield County Council searched for a new chief and hired a Mainer, E. Merle Hildreth. Much like Liddle, Hildreth was recruited from the Katahdin Council, where he previously worked as Assistant Scout Executive and Field Executive. In the first days of 1943, the council doubled its professional staff by hiring Nathaniel Doten. Doten, formerly a Field Executive in Massachusetts' Sachem Council, was to focus on Scouting in Winsted and build up Northwest Connecticut’s Cubbing program. Chief Hildreth and Nat Doten not only brought new faces to Camp Workcoeman, but also a new twist to the camp program. For most of previous seasons, a boy’s time at camp emphasized athletics and aquatics, with scoutcraft training left mostly to his troop. In 1943, Workcoeman offered a great deal more basic skill instruction, with a special focus on cooking. That summer, every Scout had to prepare at least one meal for himself. This tied into a larger theme of preparedness, not just because of the Second World War, but also to encourage each boy to be self-sufficient. The new professional staff also developed a unique theme for each of the five weeklong sessions. These different themes catered to the many Scouts who spent two weeks, three weeks, or even the whole summer at Workcoeman. The first week, commando week, fit in well with the preparedness emphasis. Boys learned wilderness first aid, marksmanship, tracking, and map making and trained in an obstacle course. Some of the others weekly themes included King Neptune’s Court and the Olympic Games. However, the highlight of the summer was Magic Carpet Week, wherein the Scouts were transported to exotic locals, experiencing festivities from around the world and across time. The boys of 1943 experienced the world from Mexico to India, from Sherwood Forest to Brazilian Carnival. At the end of the summer, Chief Hildreth instituted a new camp honor society at the final campfire. As part of an investiture ceremony, the boys acted out the Iroquois creation legend. The ceremony and the summer closed as the Scouts danced to the beat of a water-drum. 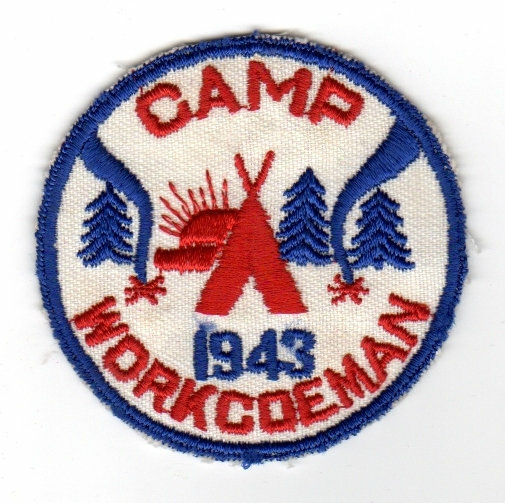 The image below shows the 1943 camp patch, the first of the seasonally issued emblems.